1. The Syrian-Turkish border region was not cleansed of Daesh, least of all of the Kurdish fighters of the YPG militia, or even the separatist Turkish PKK. 2. 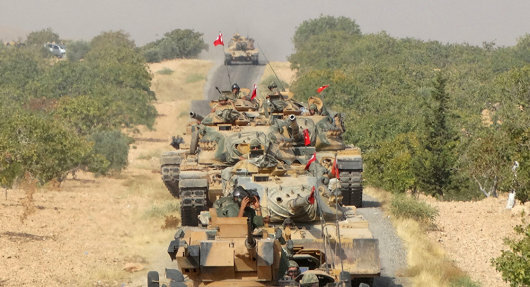 The Turkish army overran 6,000sq.km of northern Syria, but failed establish a safe zone ranging from the Mediterranean and the River Euphrates. Not a single Syrian refugee was returned home. 3. Manbij, after its liberation from the Islamic State, was not recovered from Kurdish and Syrian rebel control as Erdogan claimed more than once. 4. The Turkish army’s professional performance in battle was awarded poor marks. 5. The Americans cut the Turkish army out of any role in the war on ISIS, including the ongoing offensive against its Iraqi stronghold of Mosul and the emerging operation against its Syrian de facto capital of Raqqa. 6. The military and political steps Erdogan initiated for gaining American and Russian support for Turkish interests in Syria went badly amiss. He was left facing Presidents Donald Trump and Vladimir Putin and their shared resolve to cut the Turkish ruler down to size with an ultimatum to quit all his military operations in Syria and Iraq. DEBKA Weekly’s military sources report that the Turkish president received due warning of this ultimatum at the chiefs of staff meeting on March 7 at Antalya. Gen. Joseph Dunford, Chairman of the Joint US Chiefs of Staff, and Gen. Valery Gerasimov, Chief of Russian General Staff, notified Turkey’s top soldier Gen. Hulusi Akar that time was up for Ankara’s military initiatives in northern Syria. If the Turkish army defied the ultimatum, its troops would face obstacles wherever they turned. This happened when Turkish units tried to move into Manbij and were stopped by a US Marines armored convoy, and, again, when Russian forces were flown into the Kurdish enclave of Afrin on March 20. All the Turkish general salvaged from the Antalya showdown was permission for his army to remain where they stood in northern Syria, for the time being.